She has a Bachelor of Arts degree in Graphic Design, from Universidad Anáhuac in Mexico City. - Lebrija works in her home studio, though she also paints with a group of local artists in Westport, CT. She has been juried into several art exhibits throughout Fairfield County in the towns of New Canaan, Westport, Greenwich, Rowayton, Norwalk, Wilton, Newtown, Kent, Fairfield, Stamford and New York City. 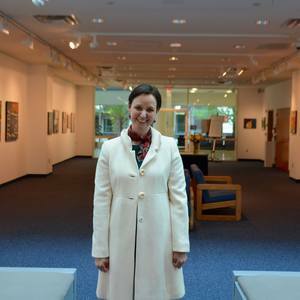 - Some of her paintings are currently in display at galleries in Southport, Norwalk & Newton CT. Katya is continually looking for ways to enrich herself by enrolling in art classes and workshops at schools like Silvermine Art School in New Canaan or the Center for Contemporary Printmaking in Norwalk CT.
- She was Art Teacher in 2013-2015, at Regina Pacis Academy, an elementary school in Norwalk CT.
- Some of her mentors include Arlene Skutch, Leona Frank, Barbara Rothenberg, Natasha Karpinskaia, Vijay Kumar, Claudia Mengel. October 2013 “Urban Colors Show”, Greenwich CT.